In 2011, the Hyundai Eon indirectly replaced the Atoz aka Santro in India as its new entry-level car; this was to be Hyundai’s first modern twenty-first century mini car. The Eon was officially unveiled in the Philippines at the 2012 Manila International Auto Show. It quickly became one of the most popular hatchbacks in its segment. The Hyundai Eon was developed to make the most out of its tiny 3,495 mm x 1,550 mm x 1,500 mm exterior dimensions but being practical doesn’t need to mean it has to look bland. While its early predecessors stuck with simple econo-car looks, Hyundai gave the Eon some swoopy styling. Like most models introduced by the Korean carmaker this decade, it features the brand’s dynamic looking “Fluidic Sculpture Design”. The front end features a large hexagonal lower intake and a slim chrome-trimmed upper grille which is flanked by large headlights. The sides are dominated by the rising crisp character line which follows the beltline shape and the fluid curves that flow above the front and rear wheel arches. The rear end design is reminiscent of the bigger Accent hatchback’s, this means it gets curvy vertical taillights which extend to the roof spoiler and a slightly concave lower hatch. This Fluidic Sculpture Design theme continues inside where you will see flowing lines on its modern dashboard and inside door panels. It features an instrument cluster with a large central speedometer flanked by a digital engine temperature gauge and fuel gauge. Thanks to the car’s overall compact size, all controls are within reach. Its center stack is straightforward. It has a 1-DIN stereo which can be upgraded to an Android AVN system, and below it are the AC controls -- comprised of main dials, buttons and a slide selector. Like most vehicles in its class, it has a low narrow center console which won’t intrude into hip room. The seating position of the Eon is high to optimize passenger legroom. When it comes to storage space, it has front door map pockets, a generous number of cubby holes, and five cup holders, that’s one for every passenger. Luggage space is a decent for its class 215 liters, this can further be expanded by removing the parcel shelf and folding the rear seats. Under the short hood of the Hyundai Eon is a tiny 814cc 12-valve multi-point injection inline-3 Epsilon gasoline engine, it produces 55hp @ 5,500 rpm and 75Nm of torque @ 4000 rpm. Power is sent to the front wheels through a five-speed manual transmission. 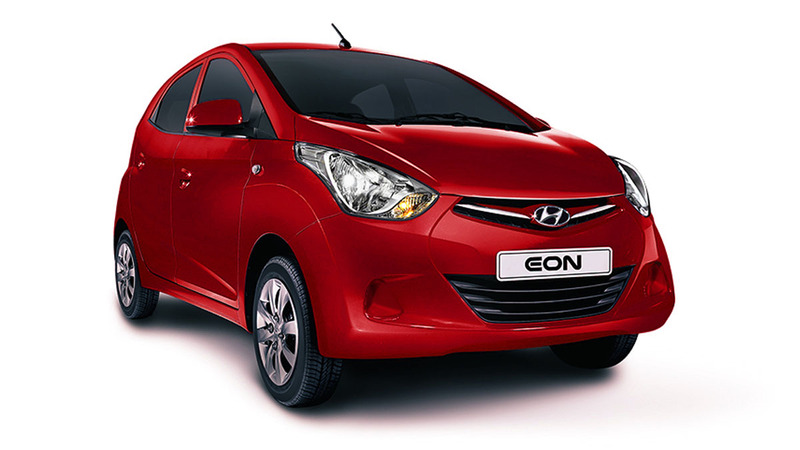 According to Hyundai Asia Resources, Inc, the Eon’s fuel efficient 3-banger should be capable of delivering 20.8km/L. The Hyundai Eon features a unibody body construction with a reinforced floor pan, radiator support panel, and side impact bars. Its suspension is handled by independent MacPherson struts with stabilizers up front and a very compact torsion beam at the rear. It uses rack and pinion steering with electric power assist, this was designed to reduce weight and help further improve fuel economy.